Who is the real ‘A’? Check out some of our theories to it. The suspects are hard to ignore! 1. Ezra Fitz: We’ve had our eye on Fitz since the first episode. Why would he play tonsil hockey with a random teenager (Aria) in a bar bathroom before starting work as a high school teacher? 2. Mona: The smarty pants-turned-popular girl seems like an obvious choice. She’s been featured in recent episodes, hanging out with the girls more often. She even started receiving texts from A. But it’s possible she’s been sending them to herself. But is she too obvious an “A” contender? 3. Jenna: We already know Jenna is a good liar, and now that she’s got her vision back, she’s an even bigger threat. She’s been a prime suspect since the season 1 finale, when Garrett gave her a page of Ali’s file. Jenna’s eclectic snow globe collection is also a bit shady, given the fact that Alison once hid a key inside her own snow globe. 4. Garrett: After admitting he joined the police force to get back at the liars, Garrett has seemed even creepier than usual. First he was dating Jenna, and now he’s kissing Melissa – what other shady business is this dirty cop up to? 5. Melissa: Spencer’s big sis recently admitted to sending Alison threatening text messages, but we’re not sure she’s A. Though, it’s obvious she knows more than she lets on. 6. Alison: Fans who’ve read the books have mentioned that Alison’s twin Courtney eventually pops up in the novels. We’re not sure if the series will follow suit, but we did notice side-by-side pictures of Alison and a look-a-like in her bedroom during the Halloween episode, making us wonder if she has a twin. 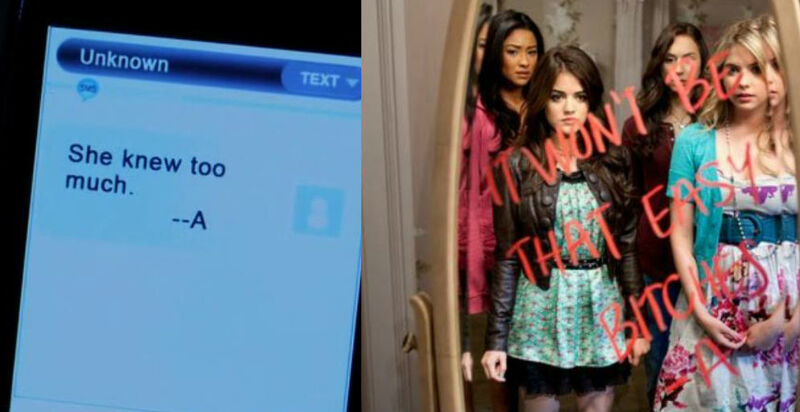 What if the projections of Alison that the girls have been seeing aren’t dreams after all? 8. Maya: We haven’t seen Emily’s ex since she skipped town a few episodes ago, but she was acting extremely suspicious before leaving Rosewood. 9. Lucas: Lucas seemed guilty the night of Caleb’s birthday party, when he and Hanna had their rowboat altercation. And although he eventually explained his behavior – he borrowed money from Caleb to make a bet on a basketball game – it’s not exactly an airtight alibi. 10. One of the pretty little liars: We don’t want to believe that Aria, Spencer, Hanna or Emily might be working undercover as A, but it’s a possibility. Catch them in ‘Pretty Little Liars’ tonight @ 10 pm.